So, the band is gigging and audiences are going away having had a great night. Of course there are better guitar players in bands out there, but this band plays a selection of songs that works for the audience. More of Saturday's gig later in this entry. I don't talk about the family much in my blog, but this last week has been great, my son, George, turned thirty on Friday, he and his wife came up from Kent, it's a four and a half hour drive for them, and Kimberley is five months pregnant so it's quite a trip for her. My daughter, who is also expecting her second child and her husband came over from Southport, which is a town on the north west coast of England, and of course, my youngest daughter who is almost 26 is living with us so she was already here. We all went out to a Persian restaurant, which I have not experienced before, the food wasn't stunning, but it was very enjoyable and the staff were very good. I had a fabulous night out with the family, it was great to see our adult kids all enjoying each others company. George treated himself to a very nice Yamaha acoustic guitar for his birthday, he paid £300 for it and I have to say it's excellent for the money. He brought it up with him to show me, and I showed him how to oil the fretboard and generally maintain it. We're very close and I am very proud of him, he's carving himself a career in Law as a solicitor at an excellent law firm and he is well thought of. I'm lucky, I have three great kids. I've been out and about trying some nice guitars this week and was really impressed with a used metallic musicman silhouette with a trem. I really think those are excellent guitars, although it's only the Silhouette I have a liking for. It sounded really clear and played very nicely, but at £1100 used I don't have the cash for it yet. I also played a Duesenberg because I have had a serious bout of gas for the sparkle red or blue single they make. When I tried it though, I didn't think it gave me the sound I was after. A few weeks ago I played a Gretsche Country Gentleman with a Bigsby on it and it played itself and sounded wonderful - instant George Harrison and the tones were fantastic, so I decided that there was no contest between the two for now. So I have narrowed my choice down to the Musicman and the Gretsche for a choice the next time my gig money mounts up enough to let me pull the trigger if the right one comes along. Saturday night's gig was at a venue we have now played three times and we go down very well at, so we like going there. I have developed a good relationship with the people who run it and call in to spend half an hour with them when I am in the area, it's about an hour north of where I live. I have to say that after all the nastiness that went off the week before, I was not looking forward to the gig at all, worrying about what might occur if our other guitarists wife was in the mood for trouble. However, that morning I'd had a telephone conversation with our drummer, Allen, who is very level headed and easy going. But he told me how disgusted he had been at the conduct of "Carole" and how she had shown the band up in a bad light with her foul language and her drunken antics and that he wanted to sit elsewhere when we were not on stage. Our bass player is not related to me, but we are "brothers", we share the same beliefs, we have known each other since we were young and our parents are friendly with each other. I don't think I have ever had a more loyal friend. But when I found out how our drummer felt and that he was on side with our bass player and myself, it made me feel a lot better. we all agreed that we don't want to lose our other guitar player as he brings much to the band, plays well and we like him. However, the nastiness towards me from his wife has been going on since before Christmas now and it is wearing us all down and we agreed that if it doesn't stop we will cut him loose and replace him. Ad's have already gone out on a website to see who responds. Anyway, my brother came to the gig on Saturday and we are very close, he also knows our bass player very well so the three of us kept each other company between sets and stayed out of the way of Mrs Satan, I was pleasant to her when I was in her company but did not make too much effort to bother with her much at all. She did not like the fact that she was not the centre of attention, and we all feel that is part of her problem, she's a spoiled brat who needs to grow up and act like an adult. No trouble started and we all breathed a sigh of relief. Now for the good stuff....! The stage at Saturday's venue enabled us to have plenty space each, so for the first time ever in this band I took my 555 out and played it live! Oh boy, did it perform for me! 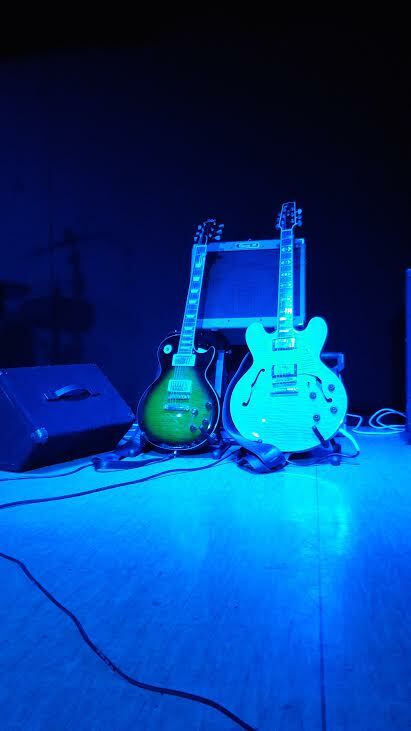 It was great to play it and it was the classiest guitar on the stage!! With the £ dropping against the $ here in the UK, a new 555 must be the best part of £3,500 now. So buying it used for £800 a few years back was an excellent decision. I played a variety of numbers on it, from Chuck Berry's The Promised Land, Santana's version of Black Magic Woman to songs by the Stones, The searchers, Dave Edmunds and others and I loved it. I will definitely take it out again when we play on bigger stages. I used the Tokai for the second set. After playing strats and a Tele for all the other gigs we've done, I felt the humbuckers gave me that bit more depth. The Heritage is an excellent guitar, built by great guys at a factory that has, pardon the pun, "Heritage". But the Tokai can really do the job and I have to say that I really do think the Japanese know how to produce great guitars. Over here in the UK USA built guitars cost a lot of money compared to what you pay for them in the States, so a good Japanese guitar will equal a gibson at half the money. So the Tokai Love Rock (Les Paul Standard) really did the job and when called for I could let it rip with a bit of lead playing and it gave me the tones I wanted for the songs. I also loved the neck which is modeled on the 59 Les Paul Standard, nice and meaty. But what amazes me was how the sunburst went through a spectrum of colours as the lighting changed, the most spectacular one looking like a Tobacco sunburst, which I have posted here, you can see some of the other colours it went on my thread on the family tree. All the colours it went were spectacular and must have looked great from an audience view. Seeing the Tobacco sunburst really made me think I ought to get one! So, the night passed without incident and I got home at 1.30. As I drive home I try not to listen to music so that I can unwind, so I listen to BBC Radio 4. at 00.45 each morning they give the "shipping forecast", which is a detailed weather forecast for each area of sea around the British Ilse. It is preceeded by a piece of music called "Sailing by" which I have grown to really like, and although I am not on a boat or ship somewhere at sea, I just find listening to the forecast - how odd is that? Well there you go, life in a band, let's see what happens next. Our drummer go's into hospital for an operation next week, so we have a drummer depping for him for six weeks, that will be interesting. A friend of mine has a Tokai Love Rock and it is a stellar guitar! - Good luck with Mrs Satan, folks like that are hard to deal with. One can only hope she will change her ways. I believe that Tokai are few and far between in America, so many Americans are not familiar with them. Get the right one and it will serve any musician really well. Mrs. Satan is just an out and out spoiled child who needs to grow up. I can't believe the trouble she has caused though. Thanks for reading, I appreciate it when people take time to read and post a comment.